The KR-20 gun case is a one-for-all mobile transport solution that safely secures rifles and shotguns up to 41” in length. 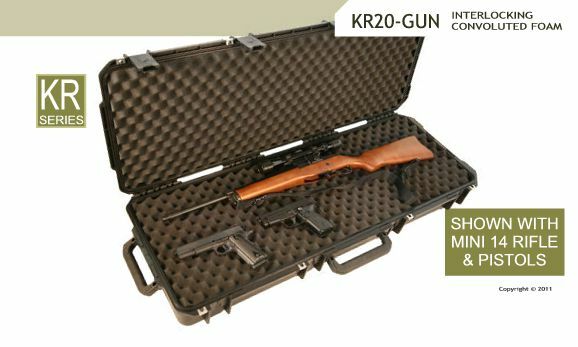 The versatile GunCruzer hard case is appropriate for civilian rifle and handgun enthusiasts, as well as military and law enforcement personnel. Its sleek design allows for many combinations of long rifles and handguns, depending on brand and size. Worry-free transport is possible because the new upgraded GunCruzer KR-20 is lighter than comparable gun case designs – a mere 19 lbs when empty – and yet more than double the strength. The gun case easy-trigger latch system outperforms competitors and is fitted with four padlock flanges that comply with new military security regulations. Also, the case can be fitted with optional Transportation Security Administration (TSA) approved key locks or padlocks. Side and front handles – with snap-down rubber over-molded cushion grips – and embedded wheels make tarmac, airport terminal and gun show floor maneuvers fast and smooth. All CaseCruzer gun cases come with an unconditional lifetime guarantee.